Happy New Year! Hope that 2016 is a year filled with love, laughter and good health. 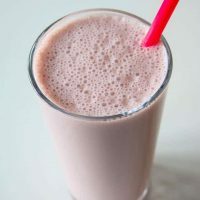 If you are feeling great today (aka, not hung-over) then this pomegranate chocolate smoothie will keep you feeling good. I don’t recommend it if you aren’t feeling quite like yourself – I personally can’t stomach any dairy if I overindulged the night before. Today’s recipe is a super simple 4 ingredient smoothie that tastes delicious and creamy. This is also kid approved because of the chocolate almond milk…I think K is convinced this is actually a “milkshake” so I may just have to call it that from now on. Kind of like how we refer to bacon as candy in our house. The hardest part of this recipe (and it is still easy) is getting the pomegranate arils out of the fruit. The arils are often referred to as seeds. There are a couple of really easy methods to remove them. I like to refer to them as the “water” method and the “release your anger” method. Check them out here. Pomegranates provide a number of health benefits and make a nice addition to a smoothie or salad. I like to avoid pomegranate juice due to the high sugar content and use fresh pomegranates in my smoothies. 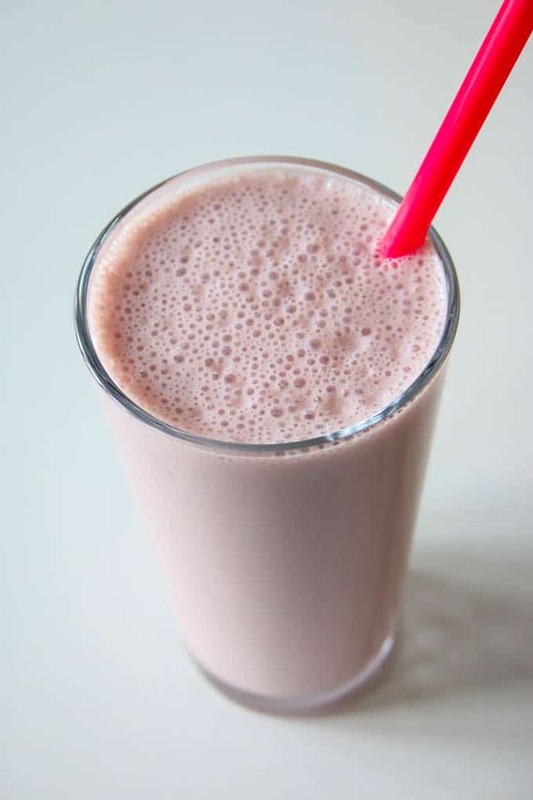 Check this pomegranate chocolate smoothie – it has a great balance of sweet and tangy. Add all ingredients to the blender and blend until you reach a nice, smooth consistency. Thanks Vicki. Hope you enjoy it! This looks so amazing, I’m definitely going to try it! Thanks for the recipe. Kristie, you are so very welcome. Hope you enjoy!